I have never paid attention in sewing books when they talked about balanced vs unbalanced plaids. While I have a lot of plaid in stash, I don’t sew them that often. And, when I have, the placement has generally worked out for me. Except this time. Meet the Unbalanced Devil Plaid. With this Cascade Duffle Coat my main focus was making sure the plaids matched at the side seam BELOW the bust dart. 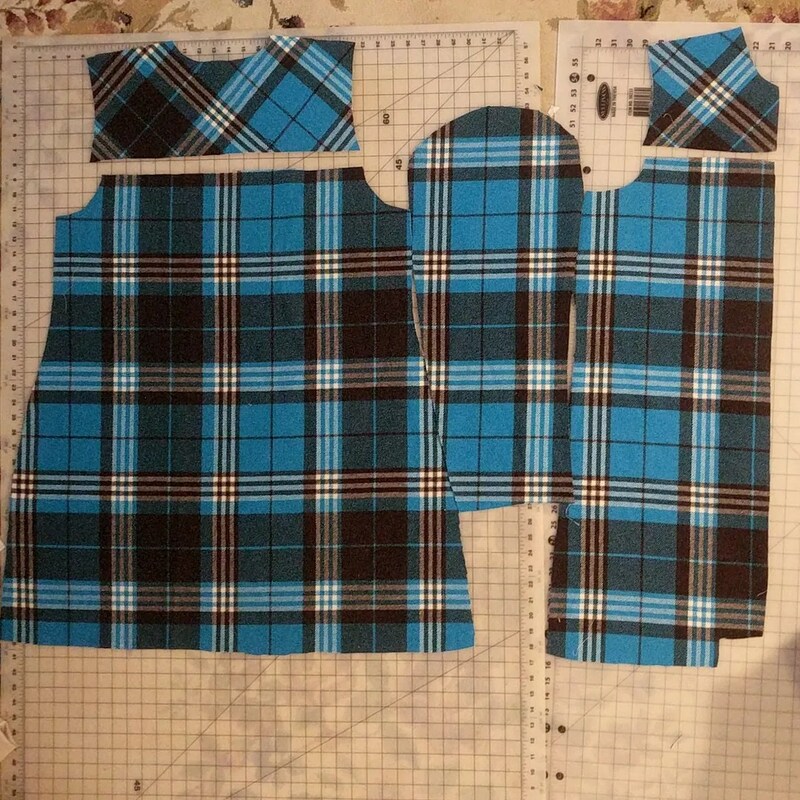 What I didn’t realize until after I cut out the back bodice is that the plaid is unbalanced. Yes, I was mostly focused on the horizontal line matching up throughout. But, the off balance of the brown stripe to the left made my eyes TWITCHY. The real solution to this would be to cut the back with a center seam and flip one side upside down and cut. That way the plaids would be balanced. But, I’d have to do that for fronts and sleeves and that was just way too much finagling for me. Because past me bought five yards of wool coating from Fabricmart back in 2015, I had enough fabric to recut the back. While the right and left do not mirror each other (on the right below), I do have the bolder brighter dark brown stripes equidistant-ish from the center. Original to the left. New cut to the right. I chose to center the turquoise rather than the wider brown because I want more of the turquoise to come through. Well, I really wanted more of the smaller white plaid to come though. But, you can see above where it got me trying to center that 🙄. What’s really interesting is I did a little poll on Instagram and it was pretty much a 50/50 split on if this was worth recutting. As sewists, we are definitely too hard on ourselves 🤷🏾‍♀️. 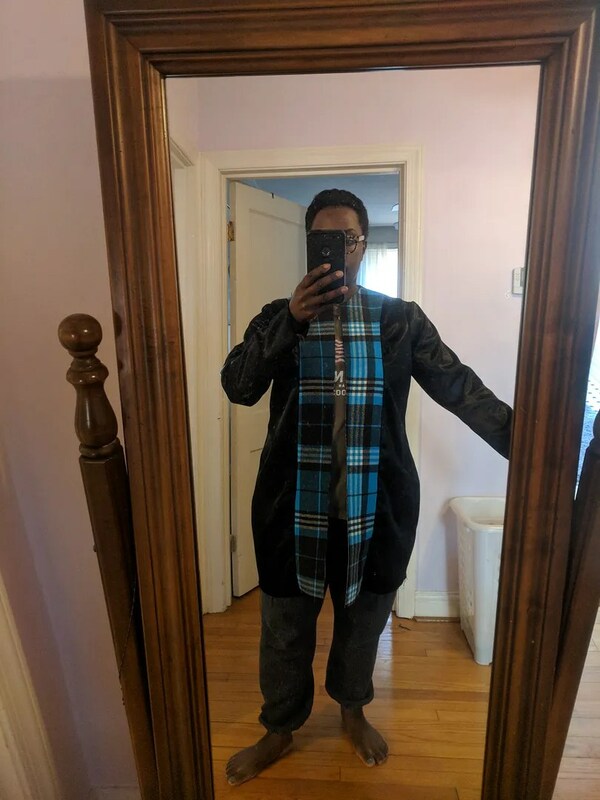 While I like it marginally better with the plaids more balanced, I may come to regret it if my sleeves are a mess and I don’t have enough fabric to recut! And, below: I’ve got the lining cut and sewn and am pretty happy. This is a size 14 with a 1″ FBA grading to an 18 at the thigh. I’ve had a bunch of unbalanced plaid in my stash for years which I haven’t had the courage to deal with. I definitely like the second back better, and your sharing your ruminations is very helpful. Looking forward to the next stage. Watching the local news this morning, the female anchor is wearing a striped top. The wide stripes aren’t straight lines, more like scallops and waves and almost chevron. The sleeves aren’t lined up with the bodice and it’s bugging me. I don’t need this on a Monday morning! But as I study it, I realize the wide waves might look odd if they did match from one arm straight to the other. White, black and maroon; but the stripes aren’t solid colors. One looks like an EKG readout with maroon “heartbeats” on white, very close the each other, but far enough apart it still reads white. The other “white stripe” has a narrow wave of maroon in the middle. I’m wondering if matching the stripes from arm to arm would seem to cut her shoulders and head from her body. Anyway, I’ve completely missed the weather forecast because I’m debating the stripes even when the anchor is off camera. BTW, I would have recut the back too. 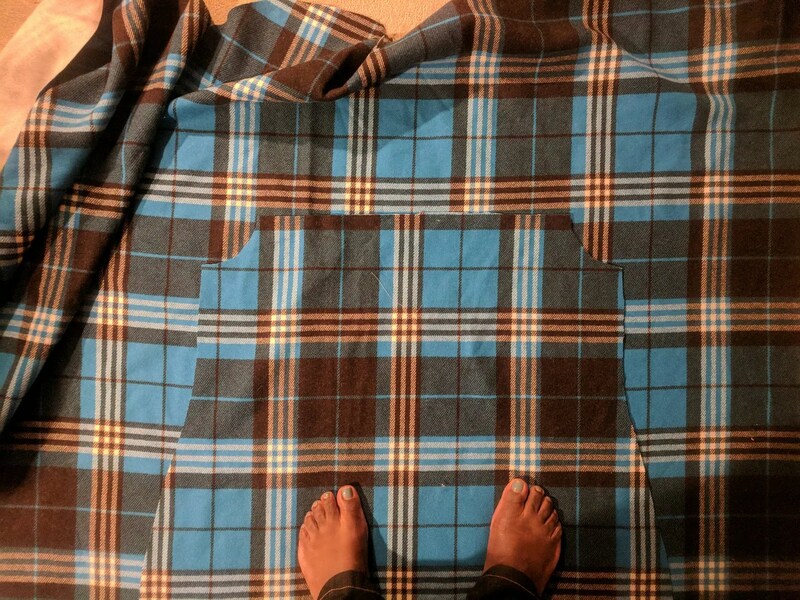 The first plaid I ever tried to sew with happened to be unbalanced, and as a beginner I said “F THIS.” — I have a little bit of plaid in my stash now (years later), but I’ve been wary of trying it for something where you’d really notice immediately that things weren’t perfectly balanced. Because I’m certain I’ll mess up the matching and what if it, too is an unbalanced plaid! Sigh. I have managed to get some RK Mammoth flannel plaid to sew a xmas present button-up shirt for my boyfriend this year, so we’lllllllll see. The lining looks like it fits you quite nicely — can’t wait to see the next steps!!!! Hahahhaaaa! I think the first plaid I tried to sew was pants and I didn’t even THINK about trying to match them. It was a nightmare and I’m glad no photo evidence exists! I like the recut back better, it’s nicer to look at. But since you’re not going to be walking around holding the unused back and asking people what they think, probably either one would be fine. This makes me glad I bought some pumpkin orange coating instead of the yummy plaid. Now to get started! P.s. Your coat is going to be super cute! I’m almost embarrassed to admit this. But, after I took the initial photo of the back, I walked around asking coworkers and friends if I should recut it. I don’t know why! As soon as I thought about recutting it I should have KNOWN I was going to recut it. And, I think this is my last foray in to plaid outerwear. I am going to just love it from a distance! Pumpkin orange sounds beautiful and I would wear the living daylights out of that. I think it’s most important to match the horizontal lines at the center, side seams, and have some semblance of symmetry across any large pieces such as the back. Looks like with the 2nd back you have that part conquered. Question: is that the upper sleeve? the way you have it laying in the photo it is aligned with the side seams horizontal lines, but the cap of the sleeve will be attached much higher and move that alignment? For plaid sleeves I match the underarm section with the top of the side seam and it usually works out, also on a well cut pattern it should match all the way up the armhole. Love the colors on this, will be so cute and cheerful for winter. I attempted to match at an underarm seam. I’m not sure yet how it will all sort out. I remember lining it up and something was off (but I can’t recall what). I have the sleeves sewn and *their* side seams match. It’s still a bit of a guess on my part if they’ll match across the front. I have enough to recut. But, I *probably* won’t on this one since I remember there being some issue I ran into when I was doing the original layout. Keep your fingers crossed! Check out this blog post on the grain line blog, https://grainlinestudio.com/2015/12/07/2015-pattern-review-cascade-duffle-coat/ in their photo of the red plaid version you can see the sleeves and how they don’t line up across the body, which always bothered me (I think when pattern companies are promoting a pattern they should show the very best version of said pattern) anyway – the one on the left, the grey plaid version, the sleeves are lined up very nicely. For a two piece sleeve like that, match the under sleeve to the garment side, (match the dot of the bottom of the armhole) and then match the upper sleeve to the under sleeve. At least that has worked for me. Plaids are definitely a puzzle and a brain workout !! Yee gads!! Devil plaid indeed! That is a pretty devil plaid and I can see why you were ruminating over where you wanted the dominant brown to be placed. I prefer the second cut out of the back also. I tend to agree with Beth about where to balance the pattern placement on this beast of a fabric. It is going to look fantastic on you. Love seeing your beautiful pup, Linus( right?) as your sewing assistant. Perhaps the first cut of the back could be utilized as one of the sleeves if need be. I am making a throw in oversize gingham checks and uneven plaid was probably a mild cuss word. I would have re-cut too. That said, I think all anyone will notice is how good you look in these colors. Don’t give up on plaids–just the devilish unbalanced ones! Beautiful! You did just what I would do. That is going to be one cute coat. Wow–you’ve shared some excellent information about your process and what informed it. Much appreciated! 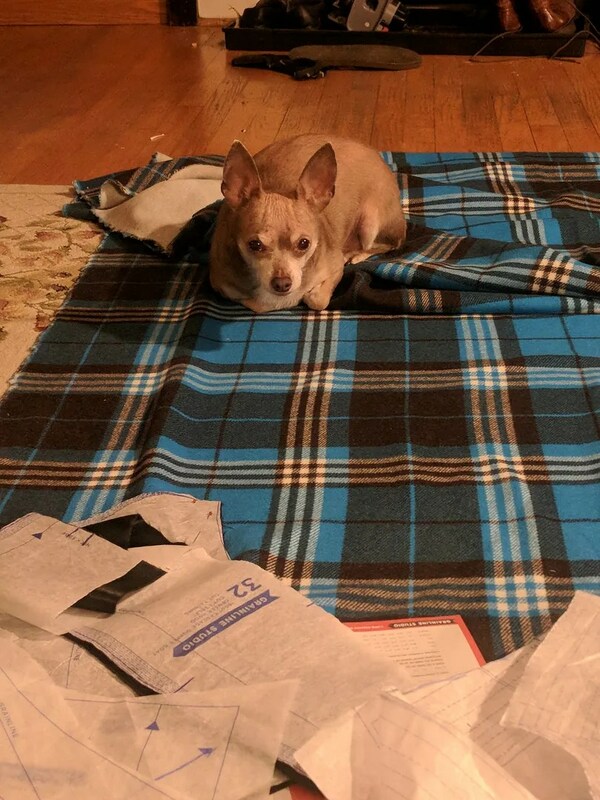 I love the pic of your little sewing companion–isn’t it great when they think you’ve laid the fabric out just for them to use as a cozy resting spot? I definitely would have recut the plaid and I’m sure you’ll be happy that you did. Nothing worse than completing a garment and then second-guessing yourself. Good luck and thank you for such an informative post! I have to admit that, if I have the time, I like puzzling out odd fabrics… plaids and toiles for example. But when time is at a premium, or fabric is a little tight, it is nerve wracking! I think you made the right choice in re-cutting, it does look balanced even though the plaid is uneven. 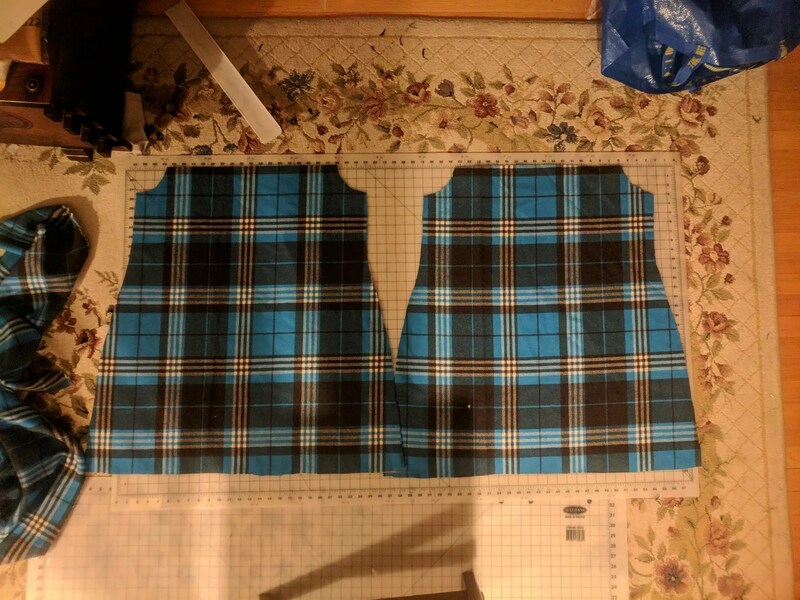 Also, interestingly, your second cutting gave you more of the white plaid that you had initially wanted… notice that in the centered version you only get thee full length lines, but in the second you get four! Beautiful so far! I am looking forward to the finished coat for sure.